The nuclear company Fennovoima (biggest shareholder formerly was the German nuclear company EON; other shareholders e.g. Ruukki (2 %)) wants to build a new nuclear power plant in Finland in Pyhäjoki (formerly they were considering Simo, too). On October 5, 2011 Fennovoima announced their site selection for Pyhäjoki. "In the beginning of Fennovoima project in summer 2007, the company had almost 40 alternative sites. The number of alternatives was decreased gradually based on assessments and in December 2009 Fennovoima ended up having two alternatives, both located in Northern Finland: Pyhäjoki and Simo municipalities." "First preparatory works on Hanhikivi will be started in the end of 2012 at earliest. The construction schedule will be elaborated after the plant supplier has been selected. Fennovoima sent bid invitations for Areva and Toshiba in July 2011 and the plant supplier will be chosen in 2012-2013." The end of Fennovoima NPP project? In July 2010 the Finnish parliament granted Fennovoima a decision-in-principle for its’ plans to build a new nuclear power plant, but the company has not been able to apply for a construction license from the Finnish government yet. An attempt to construct a new reactor in Pyhäjoki, on Hanhikivi peninsula, a mainly untouched area with many endangered natural habitat types, is one of the most arrogant ones in the whole of Europe. Hanhikivi is an important nesting area for almost twenty endangered bird species, especially significant resting area for migrating arctic birds. If the nuclear power project is realized, the area will dramatically change to an industrial area. Fennovoima still does not own all the land and water areas they would need for the construction, the land use plans for the nuclear power plant are not legally valid, and the company has not been able to show any solution for the disposal of its’ nuclear waste, which is prerequisite for granting the construction license. At the moment (autumn 2012) the master plan and the more detailed land use plan of the Hanhikivi area are in the Supreme Administrative Court of Finland, because of complaints made by the local NGO Pro Hanhikivi. During the past few months the company has faced a number of setbacks. Several of the Finnish shareholders have withdrawn from the project, the company has fired the chairman of the board as well as their CEO, and there is a lot of speculation in Finland about the possible collapse of the whole project. The latest turn at the end of October was, that the biggest shareholder in Fennovoima, the German energy giant E.ON announced they will give up on the project and the interest in Fennovoima. (Update: as of February 15, 2013 E.ON handed over their Fennovoima share to Voimaosakeyhtiö, the consortium of Finnish companies now owning 100% of Fennovoima.) Still, Fennovoima tries to move ahead with its’ plans at full speed. The company has now started an official process through the Ministry of Employment and the Economy in order to expropriate the land areas they are still lacking. This means that the company is trying to take more than 100 hectares of land by force from private persons in Pyhäjoki. Pro Hanhikivi association was founded in 2007 in Pyhäjoki, Northern Finland, in order to oppose a new nuclear power plant construction project by Fennovoima. The association is working on local, national and also international levels. During the past five years, Pro Hanhikivi has formulated hundreds of pages of opinions, responses, and complaints on the environmental impact assessment of the project as well as on the decision-in-principle granted to Fennovoima. In addition, Pro Hanhikivi has participated in several levels of land use planning, sent complaints about the project and all its’ official proceedings to all court levels in Finland, and also formulated a petition to the Committee on Petitions of the European Union. Representatives of the association have visited the Finnish Parliament several times and the European Union (Committee on Petitions) twice, and they have also participated in the Annual General Meeting of E.ON AG in Essen, Germany, in 2009, 2011 and 2012. Pro Hanhikivi now has over 300 members, and the anti-nuclear work against the Fennovoima project continues very intensively. Hanhikivi is a cape which is located in municipality of Pyhäjoki, at North Ostrobothnia, on the coast of Bothnian Bay. Minor piece of the capes end belongs to town of Raahe. The cape is about 5 kilometers long. Hanhikivi means “Goose rock” in English. The name of the area comes from a relic: an erratic block which is located at the capes end. Hanhikivi area is a significant conservation entity of land uplift coasts. There are none exactly as large unitary forest areas of this kind of coast at North Ostrobothnia. Hanhikivi area includes coast biodiversity, quite representative herb-rich forests of land uplift area, small flood meadows and hardwood-spruce swamps. In addition, the area includes other statutory preserved objects such as sea-shore meadows and gloe lakes. The area of Hanhikivi has been noted in North Ostrobothnia county planning as a nature multipurpose area. There are, also, nationally significant relics and scenically valuable rocky area. Hanhikivi area is partially limited to Parhalahti-Syölätinlahti-Heinikarinlampi-Natura area. About 63 % of Hanhikivi area has been preserved. About 170 hectares were preserved in Merestä metsäksi project (forest programme) during 2005–2006 by natural values trading, subsidy for preserving ecological values and by buying land to state. There are, also, about 110 hectares preserved in other ways. Hanhikivi is a very valuable bird migration area. Hietakarinlahti-Takaranta area has been qualified as a nationally important bird area, FINIBA area (Finnish Important Bird Areas). FINIBA areas are remarkable areas for nature conservation. They are nesting and gathering places for threatened species and species for international special responsibility. Parhalahti-Syölätinlahti and Heinikarinlampi are Natura 2000 area (code FI110420). It is defined as an nationally valuable bird water area. Also, the sea-shore meadows of Maunus are qualified as a regionally valuable traditional landscape and as the last clear-preserved sea-shore meadows. The surface area is about 275 hectares. Hanhikivi is also the name of a fixed relic, the delimeter from historical age. It has been qualified as a nationally valuable object and protected by the Antiquities Act (295/63). The Treaty of Nöteborg (Pähkinäsaaren rauha), also known as Treaty of Oreshek, is the peace treaty that set the first east border concerning Finland. The treaty was the first settlement between Sweden and Novgorod Republik regulating their border. The border began at Rajajoki, went to northwest across the Karelian Isthmus and ended to coast of Bothnian Bay. Hanhikivi is found as the delimiter of the Treaty of Nöteborg. Why Pyhäjoki instead of Simo: According to Fennovoima, "Several technical features in Pyhäjoki were more favorable. Due to technical benefits it is more feasible to construct a nuclear power plant to Pyhäjoki. Assessments show that the bedrock in Pyhäjoki is more solid. This means that operations like excavation works are easier to carry out. In Pyhäjoki, seismic design values are lower than in Simo. This has an impact on the design of the structures, systems and equipment of the plant. The length needed for cooling water tunnels is about one kilometer shorter in Pyhäjoki. In addition to these technical features, Pyhäjoki's benefit is that there are very few permanent residents and summer houses near the power plant site, which means that the construction will cause less disturbance for the neighborhood" (Fennovoima press release, 2011). Rosatom has expressed preliminary interest in supplying a AES-2006 reactor for Fennovoima as well as buying a stake in the company already in February 2013. 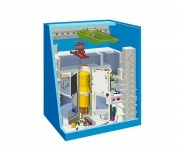 Rosatom offered the reactor design AES-2006 to Fennovoima to be built in Pyhäjoki. As of spring 2013, the boss of the Finnish nuclear safety authority, Jukka Laaksonen, switched to Rosatom - a couple of months later it was announced that Rosatom would possibly take over the Pyhäjoki NPP project. The images give an impression about the area affected by these nuclear developments. The owners of these houses won't agree on handing over their property to the nuclear industry, as well as others that refuse to do so. ...additionally the long-term radioactive waste would have to be stored somewhere safely (and that's not possible). This page was last modified on 30 April 2016, at 18:21. This page has been accessed 58,555 times.